Generically, it is required that a trustee file income taxes on any trust that they have; although is done separately from personal income tax. Special needs trusts are no different. As a trustee, it is important to know your duties when tax time comes, as well as how to file taxes properly. These types of trusts are covered in depth in a previous blog post, but if you missed it what you need to know is people with this type of trust the trust is created with the beneficiary’s money and help individuals qualify for government assistance. 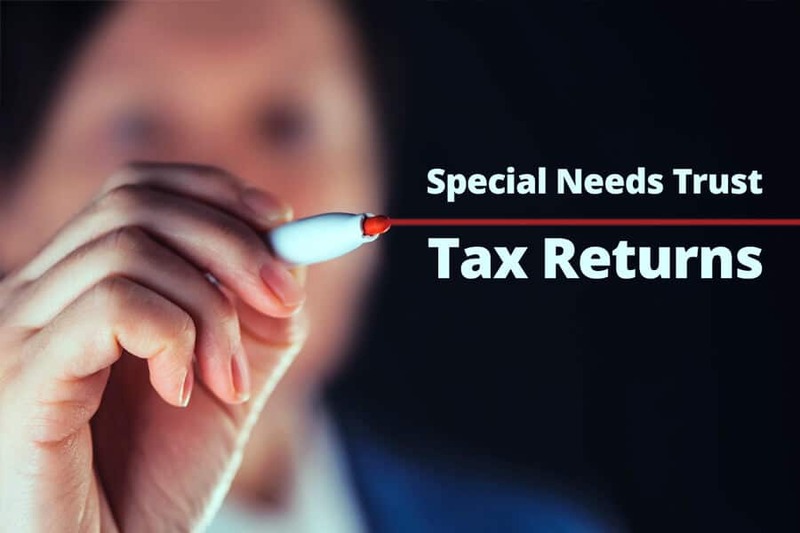 These trusts receive the tax classification of being a grantor trust; this means that the income and deductions should be reflected on the income tax filing of the person who has the disability. First-party trusts are required to be funded by the beneficiary, so for tax purposes everything will be done under the beneficiary’s name. Typically, an informational form 1041 will be filed with a letter attached explaining what the form is for. Third-party trusts are considered complex trusts when filing taxes and will also use form 1041. Third party trusts typically trickier than a First Party SNT and are more expansive. They can be revocable or irrevocable and can receive funding by more than one person as well as from outside sources. Take for example a parent who creates a revocable, third party trust for their child with the parent’s assets. When it comes time for tax filings, the parent is the one who would be required to file the taxes for the trust, as the parent is considered the grantor of the trust. But if the parent created an irrevocable trust, and a variety of people gave funds to be placed in the trust, then the trust would be taxed as a separate entity. The form is like the standard 1040 income tax form but is used for trustees to file taxes on estates and trusts. Some states, like Arizona, have a personal income tax as well as the federal tax, and in cases like this there will be a coinciding form that will need to be filled out for state tax purposes. These forms are due at the same time as regular income tax filings are due. Depending on what type of trust you have established, tax filings may have very specific requirements on what must be done. In the case of First Party trusts, the filings are done on the beneficiary’s income tax forms, where third party trusts can have a slew of complications and most of the time will be filed on an entirely separate form. Knowing what type of trust works best for your needs can save you thousands of dollars in taxes, as having the wrong type of trust for your needs can be costly. It is important to get in contact with an attorney to make sure that the trust you have or want to establish will be the most beneficial for you. Contact Susan Sandys to begin your planning today.